Corn is the most popular feed for deer but there are many reasons you may want to feed them something other than corn. Deer thrive when their food intake includes a variety of sources, simulating a natural environment with diverse plant food sources. Luckily there are some good alternatives that offer advantages over corn. The suggestions in this article are primarily for feeding whitetail but you can also apply them to mule and blacktail deer. Supplemental feeding isn’t about fattening up the deer you hunt. It is about conservation. Supplemental feeding can be especially important for diminished habitats. This happens for many reasons but the result is the same; inadequate amounts of quality food for deer. There is a difference between baiting and supplemental feeding. Supplemental feeding is to help deer when food is scarce and conditions are harsh. This means the winter months after the rut. Baiting aims to attract more deer during the months of August-November (hunting season). Corn is fairly cheap, and deer love it. But, the most compelling reason to feed deer something other than corn is because the nutrient content of corn is not ideal for deer. The MSU DeerLab suggests the best protein content for good healthy development is around 16% protein. Unfortunately corn feed is 8-9% protein, falling well short of the suggested content. The other downfall of corn is that it’s mineral content is generally lower than most other types of common feed grains. For more detail see this table. This doesn’t mean you shouldn’t use corn at all. Corn can work well as a supplement to other types of feed. One of the great things about corn is that deer love it and you should use this to your advantage. Mixing corn with the alternatives listed below attracts the deer to your feed and provides variety in their diet. As mentioned above, the best protein content for deer feed is around 16%. Many of their natural food sources such as nuts, grass, weeds, fruits, and twigs provide a variety of carbohydrates, proteins and other nutrients. When thinking about what to feed deer, you want to attempt at providing some diversification. The list of other potential feeds for deer below attempts to provide that diversity. The benefits of each are discussed below. There are some risks associated with supplemental feeding. The risks include chronic wasting disease, bovine tuberculosis, and overpopulation, incorrect nutrient requirements. If you are serious about starting a supplemental feed program you should consult a local wildlife biologist. Make sure to check your local regulations before planning any supplemental feeding or baiting. Many states do not allow you to feed or bait due to the risks discussed above. One of the major concerns with feeding deer especially during winter is acidosis. Acidosis happens when deer eat too much of a high carbohydrate source like corn without allowing time for their digestive system to adapt. Acidosis can cause death. For this reason, the Micigan DNR recommends using less than 25% corn. It is important to be very cautious about feeding deer corn during winter. Their digestive system adapts this time of year to eat high protein, high fat, high fiber. For more information on the dangers of incorrect feed during the winter, checkout this article by bonecollector.com. During summer, spring, and fall deer are better able to utilize feed sources with higher carbohydrate content like corn. It is still likely best to mix this with a high protein source. Food plots are a great way to provide deer with supplemental feed. They are safe, effective, and legal no matter where you live. This is the number one preferred way to supplement deer. Here are two quality plot seeds by BioLogic on Amazon: New Zealand Maximum and Winter Peas. For more information about food plots, visit the QDMA website or pickup this book. If you have trees and brush you can trim on your property, pruning them can be a great way to supplement deer feed. This has the advantage of providing them with food they naturally eat. During the winter, deer have adapted to consume high fiber, high protein twigs and brush. This is an excellent choice for supplemental feed. Purina has formulated their feeds to meet proper deer nutritional ratios. It has a high protein content and ideal amounts of vitamins and minerals. Buck Grub works incredibly well as an attractant. It is probably too expensive to use as a regular feed but you can use it as part of a mix or during that time of year you want to lure those bucks in. Just make sure to check your state regulations first. Rice bran feed provides a good amount of protein (13%) and is similar to oats in nutrient breakdown. It is recommended you use rice bran as part of a mix and not all by itself. Alfalfa bales are another commonly used feed for deer. They are a much better option than corn or hay. Alfalfa is easily digestible but will not come cheap. It has a high protein content of 15-20%, depending on the cut. You should always mix soybeans with other types of feed due to the high fat and protein content. The protein content is roughly 40% so you can mix it with corn to increase the total protein intake. A mixture of 50% corn and 50% soybeans is common although limiting corn to 25% is better. You can use oats or rice bran for the rest of the mixture. Farmers use creep feed for calves as a source of supplemental nutrition. It is a mixture of corn, oats, alfalfa, barley, soybeans, and minerals. If you decide to use calf creep try a variant around 15% protein. What type of feeder should I use a deer feeder? A good feeder for someone just starting is this 5 gallon feeder by Moultrie. The setup is straightforward as it uses AA batteries. Fill the feeder and select the number of times per day you want to feeder to dispense. It comes with a locking lid to keep the feed dry and animals out. How much feed do you need per deer? A common rule of thumb is 1 feeder per 25 deer, each deer consuming 1-2lbs. Of feed per day. Deer aren’t coming to my feeder, what can I do? Spread some molasses in the brush near your feeder. This will act as an attractant and bring deer to the area. There may be some debate, but cracked and shelled corn both seem okay. 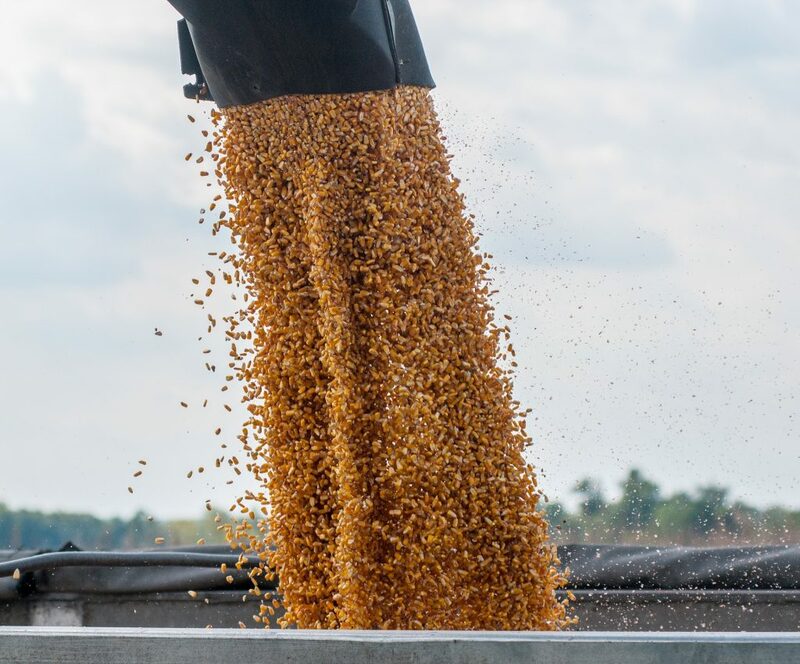 There was a study that found cracked corn is more digestible. Make sure to use a feeder that keeps the feed covered and dry. This will prevent the feed from getting moldy. If the feed becomes moldy, it is best to not feed it to them. If you setup a mineral block, make sure to do so near a water source. Having it near a water source will tie it to their natural routine of needing water. Where can you learn more about feeding deer?